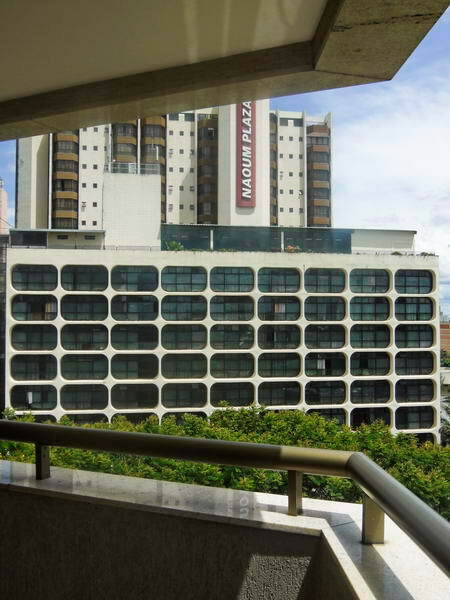 I certainly wasn’t the right kind of person for my hotel in Brasilia last month. I never even got to see the sauna, gym and swimming pool, there just wasn’t time, and I really made very little use of the two balconies my suite was provided with – one on the bedroom and the other on the living room, nor did I get time to even sit in all the chairs or watch the two TVs. Other than the bed and bathroom (or rather shower room) about the only other facility I got to use was breakfast. Included in the room price, if bought separately it would have cost about what I normally think of paying for a hotel room. It was a buffet and I made the most of it, eating fully if not particularly well, although the scrambled eggs were good. After a leisurely breakfast I walked back to my room and got a phone call to be in the foyer in ten minutes where I’d be picked up to go and help hang the show. Two guys arrived in a car and we left for the Espaco Cultural Renato Russo. 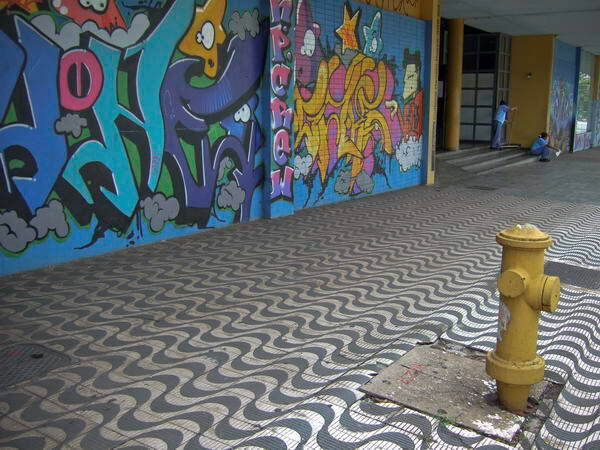 Brasilia is both simple and confusing. The afternoon I’d arrived I had been taken to see where my show was to be hung, but had no idea of where it was in the city. The normal rule seems to be that to get anywhere you start by driving in exactly the opposite direction. But by now I was beginning to the hang of things, and was not at all surprised when we drove past the Espaco and some way on before turning back and through the superquadra (neighbourhood block) to park at the back of it. Neither of my companions spoke or understood more than the odd word of English, but I watched as they brought out a large brown-paper parcel and started to unwrap it. These were my prints, made at the best lab in Brazil, in Sao Paulo, and they were superb. A perfect match for the files I had viewed on my screen over 5,000 miles away (just slightly larger than my widescreen monitor) before e-mailing them for printing. Which shows that colour management can really work. A monitor with a good profile and an Adobe RGB file should translate through a properly profiled printer to a close to perfect result, but it so seldom seems to. It isn’t long since I phoned one well-known lab to ask about profiles and how to send my files to be told “we don’t take much notice of that sort of thing.” My work went elsewhere. I had six panels in a rough hexagon on which to organise the 24 prints. The panels did have two sides, but because of their position not all could sensibly be used on both. My show was in two parts; six prints on the Manor Gardens allotments, and the rest. There was also a panel of text. I decided it would work well with most of the work inside the hexagon, but it needed a couple of prints on the outside in the main passageway as well as the text to draw people’s attention to the show. That left me with an almost perfect fit. Two panels with 3 prints each for the Manor Gardens work, which was a nicely loose spacing, then the remaining 16 prints on the other 4 inside panels in a fairly tight single row or 4 to a panel. These were in chronological order, with the two most recent works saved for the outside panel. I’d actually chosen these works specially to illustrate the international nature of the work. 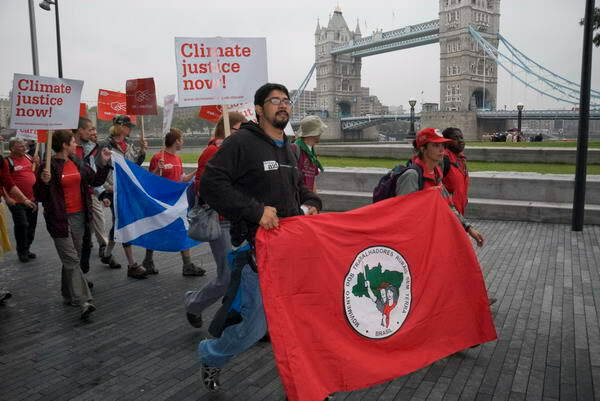 Although both were taken in London, one showed Brazilians leading a Christian Aid ‘Cut the Carbon’ march, and the other was from a protest against logging in the Tasmanian forest. Having explained (with much gesture) how I wanted the work hung I got out of the way, looking at the other shows on in the centre – including some interesting black and white student work, as well as the show by Susana Dobal, and colourful pictures from India by Gisa Müller, before sitting down on the steps leading to the main street to make some last minute corrections to my lecture for the evening. Before I had finished the show was hung and we were in the car heading back to ECCO, where I was to meet festival director Karla Osorio and lunch with her and the British ambassador. More of my pictures from Brasilia. This entry was posted on Friday, January 4th, 2008 at 04:02 pm and is filed under My Own Work, Photo Issues, Photographers. You can follow any responses to this entry through the RSS 2.0 feed. You can leave a response, or trackback from your own site.